As Earthshine runs its fundraising campaign to bring a planetarium to Mississauga, we will review some of the highlights of the public astronomy program run in Mississauga over the past few years. On June 5, 2012 the planet Venus passed directly between the Earth and the Sun. This resulted in a rare transit (a mini-eclipse). These events are so rare that many famous astronomers who lived during the 20th century never saw one. Recent Venus transits took place in 2004 and 2012 - and before that, in 1874 and 1882. They come in pairs, 8 years apart with over 100 year periods in between these transit pairs. Members of the Mississauga Centre of the Royal Astronomical Society of Canada partnered with the University of Toronto at Mississauga to provide telescopes for members of the public to view the transit. These telescopes were equipped with special filters which allowed only a small amount of sunlight to reach the optics, thus making viewing totally safe. Although the weather on June 5 was very cloudy, the skies completely cleared by 5:00 pm, just in time for the beginning of the transit. 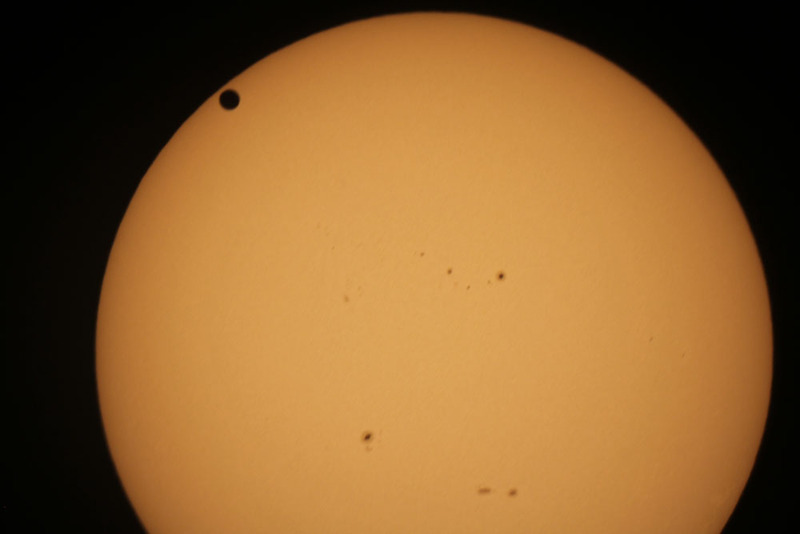 At 6:09, the limb of Venus was visible moving onto the face of the Sun. We were able to watch Venus slowly move across the face of the Sun until sunset just before 9:00. Over 1,000 people came out to witness this rare event. Another memorable public outreach moment for the RASC.